During an AMA (Ask Me Anything) on Reddit it was asked about Garrison and musics, the "original" one being quite a loop 24/7. This is the answer! From 6.1, people will be able to change the music in the background in their Garrison. To be honest, i am more than excited to see this change coming live, being a BC player this specifical Music Roll will always be my favourite. We are working on a way for you to have custom music in your Garrison. Hoping to get this into patch 6.1.0. I am personally super stoked about this! A music roll is a storage medium used to operate a mechanical musical instrument. They are used for the player piano, mechanical organ, electronic carillon and various types of orchestrion. The vast majority of music rolls are made of paper. Other materials that have been utilized include thin card (Imhof-system), thin sheet brass (Telektra-system), composite multi-layered electro-conductive aluminium and paper roll (Triste-system) and, in the modern era, thin plastic or PET film. This item adds the "The Burning Legion" theme to your garrison jukebox (see the full guide for more details). Up for a journey into the Black Temple? You still won't be prepared for the hard hitting bass of the track you'll find. Travel to Shadowmoon Valley in Outland, enter the Black Temple raid instance, and defeat the final boss Illidan Stormrage (not a 100% drop chance). I done BT twice this week and on my Lock and on my Druid I got a music roll and a the Main hand Warglaive on both toons. Is this dumb luck or due to I am using a class that can't use the Warglaive set? Will be running this more later today will fill in the blanks with 6 more toons. This is the soundtrack which was used for the TBC login screen. By far, the most difficult song to drop for me. 8 tries already and nothing, and that is the only one remaining. You found Jukeboxus! Musical Roll of "The Burning Legion"! 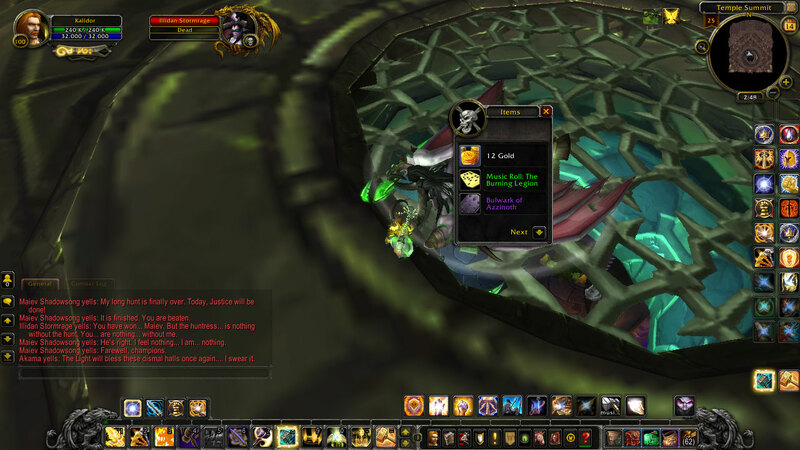 Just got the Music roll with the Warglaives off-hand, today was a good day. TBC: Weekly raid with Guild. Draenor: 6.1 New pets and now freakin music roll. Top it up with 1% drop chance. So freakin tired of this instance. If you're like me and came in WAY after this raid was made, here is a video I found helpful to get you through it. https://youtu.be/2vtEA50-_fQ It's not mine, but I went through quite a few videos before I found one I could follow to get to Illidan. WHY so low drop change ? IT not a F dragon Mount ! This is pain because this raid can not be cheezed with a alt. You must do ALL the bosses weekly to reach Illidan again. 3% droprate is very harsh. Use: Add "The Burning Legion" to your garrison's jukebox.